Being short-stacked in a no-limit hold’em tournament is never ideal, whether during the early, middle, or late stages. Whereas a big stack affords you a wide range of options both before and after the flop, when you find yourself having dwindled to less than 10 big blinds’ worth of chips, you often are reduced to two choices, both pre-flop all in or fold. 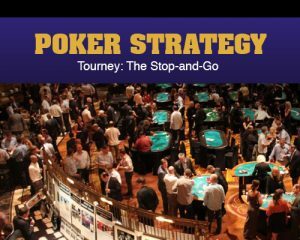 For players in such a spot the so-called “stop-and-go” play provides one other possible course of action, although it is a maneuver that is sometimes misunderstood and thus misused. The play – an all-in commitment of one’s short stack performed in two stages rather than a single shove requires a special set of circumstances to be effective. The idea behind the stop-and-go is to increase your “fold equity” even by just a small amount, despite your short stack. Fold equity refers to the chance an opponent will fold to your bet and the subsequent gain in chips that will result. Sometimes fold equity is expressed as a formula, with the likelihood of an opponent folding (between 0% and 100%) multiplied by the pot you would win if he did. As your stack gets shorter, it becomes more difficult to pressure opponents into folding hands when you raise. They know that by calling they can only ultimately lose so much, and thus will become more willing to call you. Meanwhile, when the biggest stack at the table makes a preflop raise, players know that playing a hand against him could end with their elimination from the tournament, and so they’re more wary. With a bigger stack, he has more fold equity than you do. When played correctly, the stop-and-go play increases your chances of getting an opponent to fold and concede a pot to you despite your short stack. Of course, with the stop-and-go there’s always a chance the flop helps your opponent and thus encourages him to call. Say he sitting there with Kd-10c when that king-high flop comes — he’s obviously calling, and when he does you’re in tough shape. But if you had shoved pre flop he probably would have called there, too, so the result isn’t really different although it might seem so given how your last chips went in as a dog rather than as a favorite. Note that the stop-and-go is a “special case” play that can only be attempted when the circumstances are correct. You must have a short stack but not too short to make dividing your all-in push into two stages irrelevant. That is, you need 7-10 big blinds or so — with less, just go ahead and shove pre flop. Also, you will be out of position and heads-up after the flop. And even if all of these circumstances are in place, take a moment to think about what you’re doing before trying the play. It could very well be the case that in certain situations against certain opponents, going ahead and pushing pre flop is the better move.